Almost four years later, we live full-time in beautiful Puerto Rico. 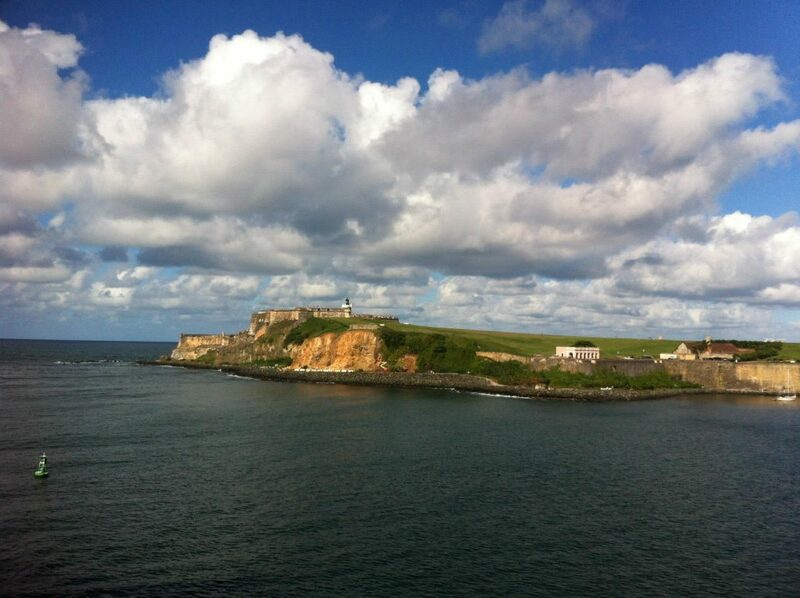 When my parents recently came to visit, El Morro was at the top of our itinerary. For their visit, we approached on foot. Our Uber driver dropped us off at the long walk way leading to the entrance. Once again, I was still mesmerized. Our family name is Morrow, so we jokingly refer to El Morro as the Family Fort! My Dad was excited to point out our namesake on the sign. My Awesome Parents visiting the Family Fort! Notice the hats and sunglasses? The sun is brutal, and there is not much shade exploring Old San Juan and the Forts. Remember sunblock, you will thank me later. El Morro Castle, complete with Moat! The National Park Service has strategically placed information signs throughout the park. Signs and employees are bilingual (English and Spanish). 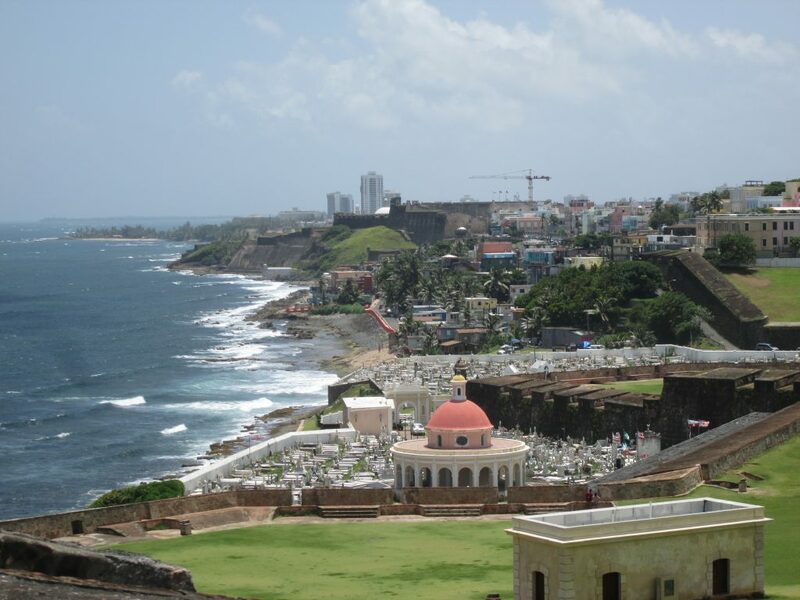 The views are spectacular over the Atlantic Ocean and Old San Juan. Gorgeous views from every angle. 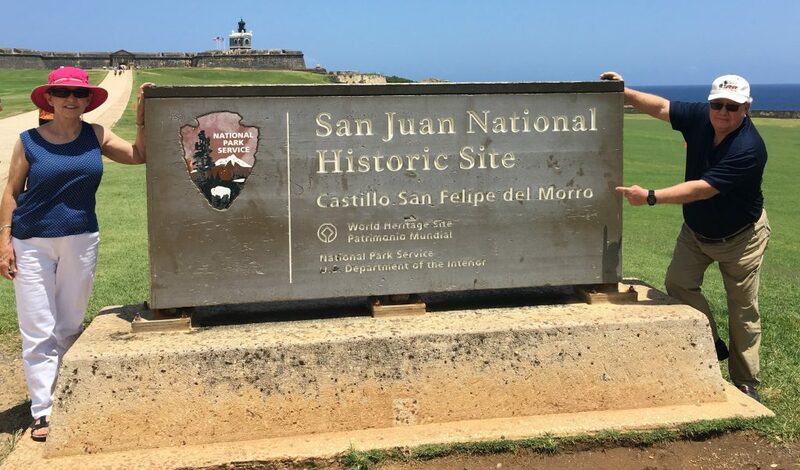 There is a $5 entrance fee (same day visits) for both fortifications, Castillo San Felipe del Morro and Castillo San Cristobal in Old San Juan. We spent a couple hours exploring the fort. If time is tight, you could easily explore everything in about an hour, missing out of the history exhibit if you are short on time. 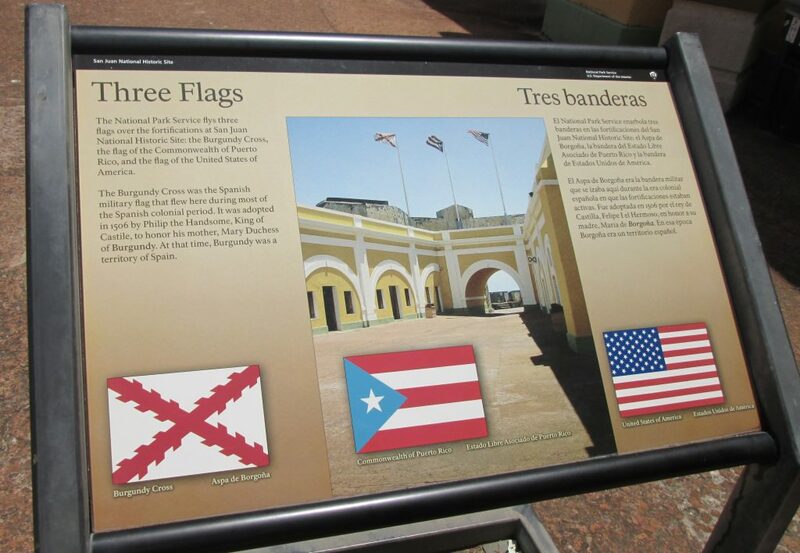 There is a free trolley that runs during the day, hop on and off to explore Old San Juan. As part of the National Park Service, Annual Pass Holders get free admission! 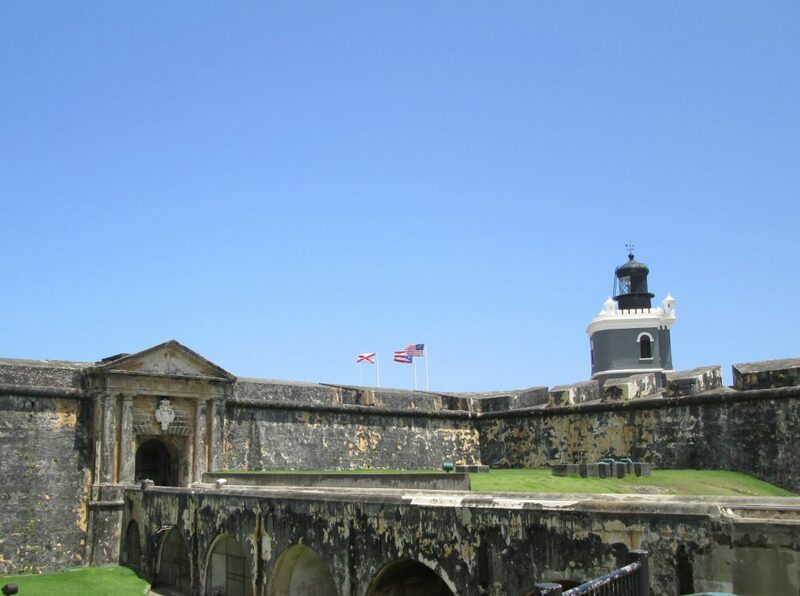 El Morro Fort is a not-to-miss attraction for anyone visiting Puerto Rico! Open 7 days a week. Sundays tend to be busiest due to Cruise Ships. I just love old forts. I’ve been to several in the Southeast (like Florida and Georgia) but this looks really cool too! I love the history you can learn about by visits like these! Cheers! Wow! This place is beautiful I get used to going there once. I actually love it. I love visiting forts and historical sites period! I would love to go to Puerto Rico too. Is this an all day activity or something you can accomplish in a few hours with time to sit around the shoot the breeze? When we come to visit, I expect to see Casa de Morrow restaurant set up next to this place. It will become a historical landmark in no time. People will be confused about which Morro(w) came first. But seriously, if you do decide to erect a restaurant, I’d like free drinks for life. The fort can be toured in a few hours. I really need to work on the themed restaurant, at least a nice bar for a cool beverage! I love old forts and I’ve been fortunate to find so many good ones around the world. This looks like another one. There’s something really special about the ones on the ocean and they are normally on such amazing rock formations, rock ledges, outcrops etc that just add to the atmosphere. Good tip for others about the sunscreen. As Australians, we don’t travel anywhere without sunscreen, hats and sunglasses so we are always well prepared but I know many who don’t. One of my best friends from college was from Puerto Rico and l got to visit his family a few times. I remember visiting this fort many, many years ago. Still as beautiful as ever. Nice that you live there full time now. I love the idea of a trolley whisking you through there! Also these old fortifications are amazing. My favorite is in Essaouira, Morocco. 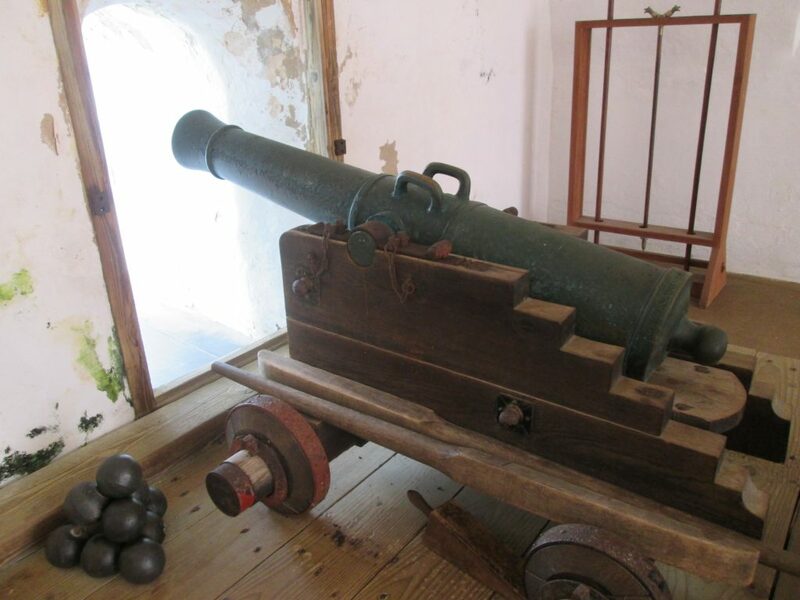 By far not as big but the canons remind me of this. I’ve always dismissed Puerto Rico as a beach destination. The more I learn about its history, the more I want to go! The beaches are amazing! There is just so much more to this little island than just beaches; architecture, history, art, nature, rain forest, mountains and hiking, just to name some of my favorites! This just brought back great memories of my trip to PR for the first time this year! I also visited this fort and was wowed by the history behind it. The views alone make it worth a visit! I bet San Juan is amazing to live in. PR is awesome! 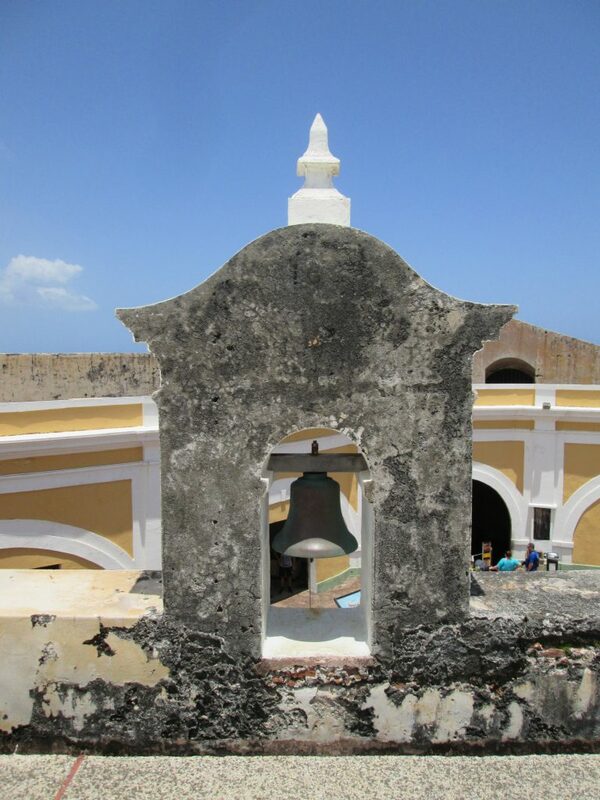 I cannot imagine living in San Juan – tourists and traffic! I live in a small beach community, far away from San Juan. There is so much more to Puerto Rico beyond San Juan. Thanks! My Mom and Dad goofed around the entire trip – it was a blast! Best $5 (each) that we spent on the island! 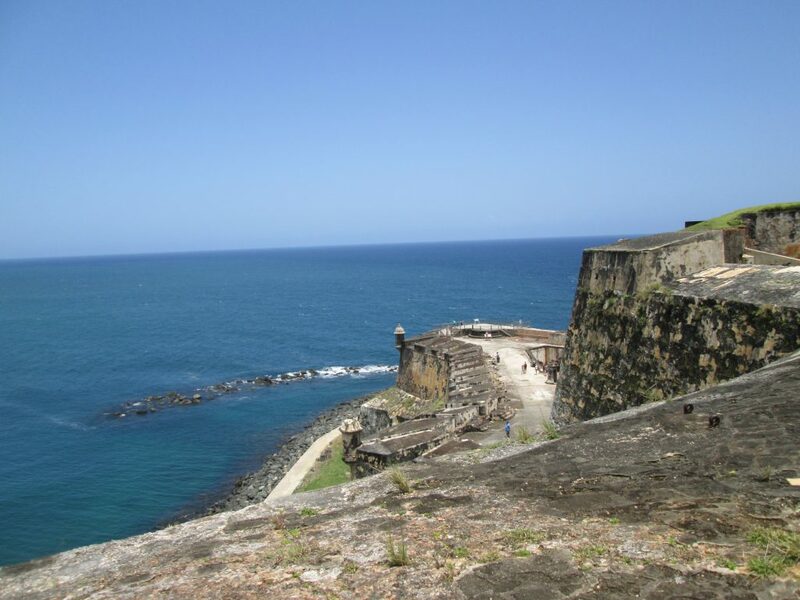 You’re so lucky to call Puerto Rico home now.. what gorgeous views… even if the sun is strong and harsh. That fort definitely looks like something I’d be interested in on a trip there. Yes, we have so many iguanas! My dog chased an iguana out of the yard yesterday, in his defense, he just wanted to play. What an fantastic memory! It really has not changed much, and I bet it is more enjoyable now! 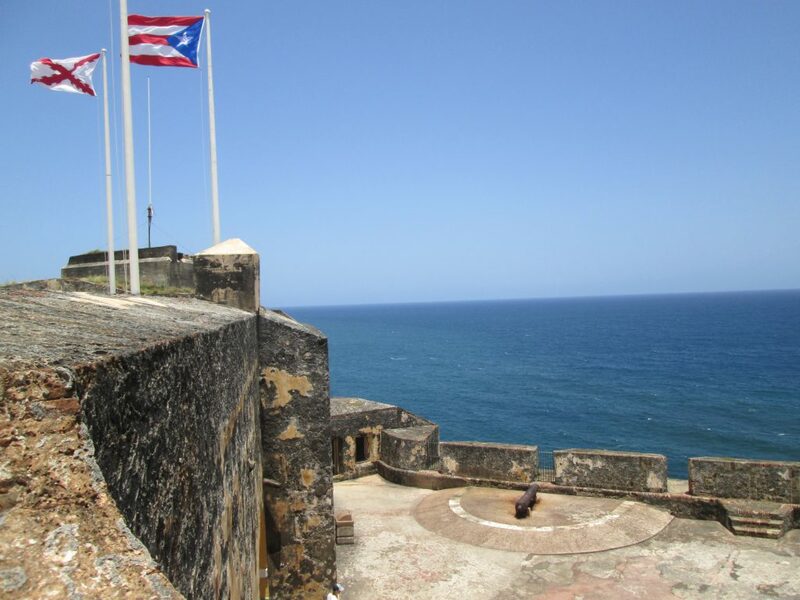 This brings back memories for me of when I visited Puerto Rico and the fort with my mother at 15. You’ve made me want to go back. How handy to have the free shuttle. You parents are cute with their family fort! Awe, thanks! My parents had a great time being goofy. It was such a fun day! 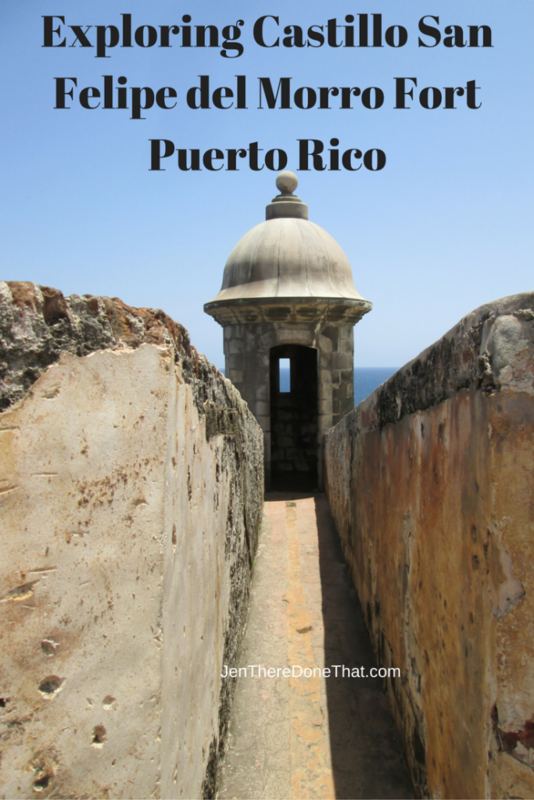 Visiting this fort was definitely one of the highlights of our visit to Puerto Rico. Your post just reminded me though of how hot that day was for us too. Lots of sunscreen is a must for sure as there is basically no shade when visiting the fort. This is such a cool fort! Even better because it’s your family fort haha, your dad is so cute in that pic. Does it get a lot of visitors? Looks like you guys had the entire place to yourselves! It is a really popular tourist attraction. The cruise ship days, it gets really packed, especially on Sundays. We went on a non-cruise ship day and there were very few people. We had the Family Fort all to ourselves, you know, ’cause we are kinda a big deal. haha! I love the fact that you have returned to Puerto Rico to live having been so taken by it on the first visit. I also love the pic of your folks visiting and the anecdote about El Morro becoming your ‘family fort’. So cute. The fort looks really interesting too, if a little hot!! How I’ve managed to never visit Puerto Rico is beyond me. I love the mix of history and gorgeous views. That’s a win-win in my book. You should come visit! Fair warning, we loved it so much, we moved here. Hahaha, love the photo of your family cheesin’ it up at the family fort. But man, that must have been scorching without any real shade. How hot does it get there this time of year? It was mid-80’s when we went. My parents live in Phoenix, Arizona so it was 30 degrees cooler in Puerto Rico for them! I love your “family fort”!!! Haha…also love that you live in San Juan full-time. Amazing, I’m sure you have quite a story!